Several ionic liquids promote depolymerization of wood components, i.e., polysaccharides and lignin, into low molecular weight compounds, some of which further re-polymerize into resin-like compounds. 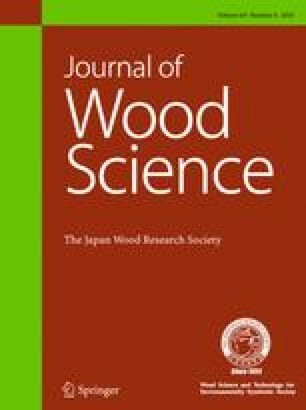 In this study, the depolymerization/re-polymerization of wood components in ionic liquids was applied to preparation of plywoods from Japanese cedar (Cryptomeria japonica) veneers by employing ionic liquids as adhesives. The adhesive solution was prepared by mixing an ionic liquid (pyridine hydrochloride ([Py][Cl]), imidazole hydrochloride ([IM][Cl]), or 1-ethylpyridinium chloride ([EtPy][Cl])) with water and d-glucose in various weight ratios. Tensile shear test of the three-ply plywoods prepared from the veneers and the adhesive solution through hot-pressing indicated that the plywood bonded with the [IM][Cl]-based solution ([IM][Cl]/water/glucose ratio: 9/3/2) exhibited the highest strength. Scanning electron microscope observation on the plywoods suggested that the ionic liquids softened the cell walls of the probably plywood through the depolymerization/re-polymerization reactions and the cell walls were compressed during the hot-pressing process. Entwining of the compressed cell walls and van der Waals force enhanced by the compression were considered to be origins of the adhesion of the veneers.